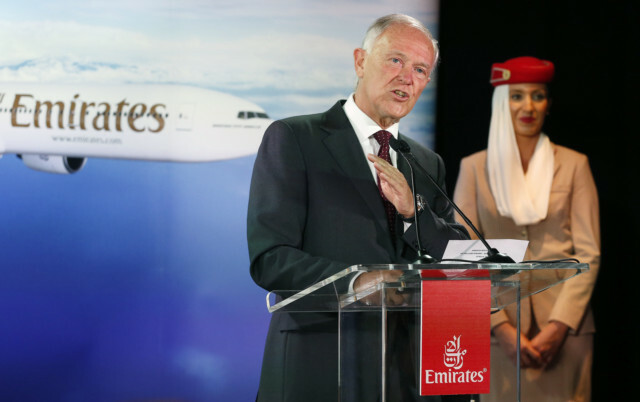 Boston: Emirates has seen a better financial year this time round compared to last year, profitable returns and a strong balance sheet, the president of the airline, Sir Tim Clark, said on Tuesday. But he added that growth sometimes brings its own problems especially in aeropolitics. “Emirates has become an extremely well-known global aviation brand. It is now the number one airline brand in the world. That brings great kudos and problems because people are concerned about us and try to block what we do and we spend time trying to deal with that,” Clarke said. Emirates launched its 8th route to the US and its 142nd destination on its global network when it began a daily flight to Boston’s Logan International Airport on Monday. However, he said the airline has not been able to expand its capacity into key markets like India, despite persistent requests. He added that no new seats have been given to the airline since 2008, and it has been flying to India for six years at 90 per cent capacity today. “They have given us 11,000 seats for Dubai that has to be shared between flydubai and Emirates. We had asked for 30,000 seats for starters and multiple points in India, in addition to what we have at the moment. We didn’t get any of those,” Clark said. He, however, ruled out an aviation hub in the US and said the airline was not seeking to expand other than organically. Clark also ruled out an all-economy class flight or an all-business class flight.